Tomorrow on Wednesday, October 24, 2012, I am going to go to a Virginia plantation that’s around 390 years old. 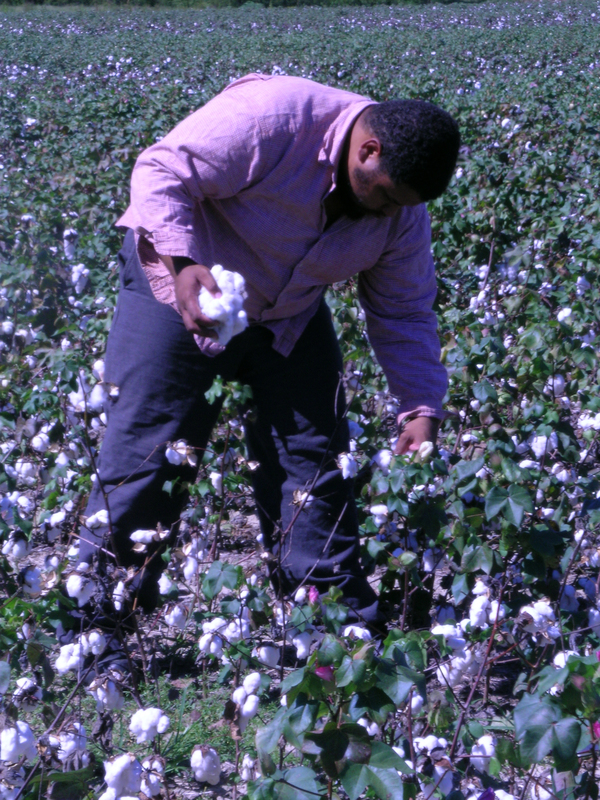 I will pick cotton for about 8 hours and hopefully it will add up to 250 pounds–an average day’s work for a 35 year old Black man, like myself, on a Southern cotton plantation. From about 1793-1945 the cuisine of King Cotton reigned supreme across the South–from Virginia to Texas–from the Northern Neck to the eastern Gulf of Mexico, 200 frost free days a year provided for the crop that would make America filthy rich and would amount to 2/3 of our exports in the 19th century. 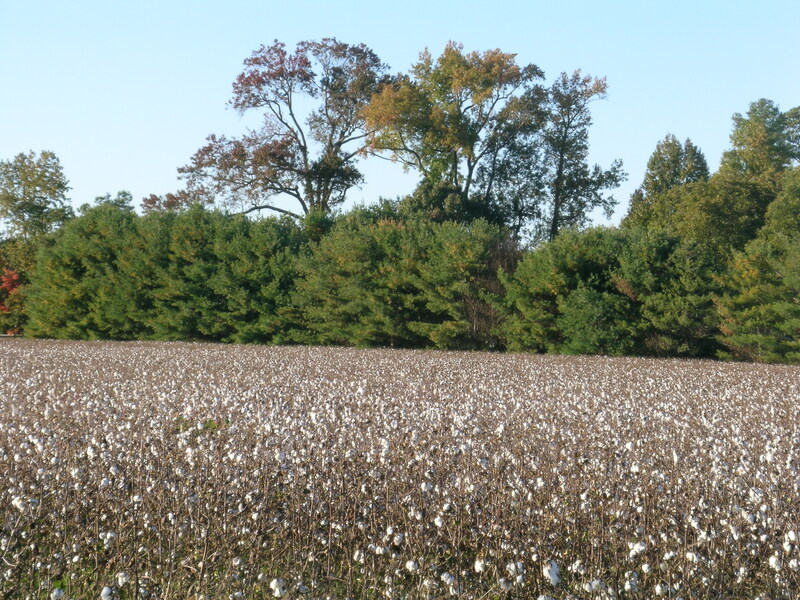 Cotton not only built the infrustructure of the South–along with tobacco, rice, indigo, sugarcane, hemp, corn, mining, fishing and ironworks, but it spured on the rise of the industry needed to process cotton in the North. Many but not all of the people who held my ancestors in slavery belonged to the 3% that had 20 enslaved people or more…but we would be ignorant of larger forces and greater contexts if we didn’t remember a simple fact: slavery greased the wheels for American progress in many many insidious ways. Most textbooks talk about the closure of the slave trade in 1808. The slave trade was greatly reduced but it was a constant right up until the Civil War. Northern and Southern elites profitted from the trade, and the labor of enslaved people made it possible for immigrants to have jobs that were constant, viable and expanding. The very presence of a landed, stable, unpaid underclass made the freedom of millions possible. We often speak of a “greatest generation.” For African Americans the massive turmoil and spiritual crimes that took place during this time period are unforgetable and should be permanently sown on our hearts. In these days of elections frought with race and references to Loy Mauch and others who would have us downplay the seriousness of slavery and its evils, its time for me to go back into the cotton field. No there will be no white folks whipping me or any of that. In fact if you are a white Southerner, most of your folks were probably in those fields after the Civil War as tenant farmers and sharecroppers yourselves living a hard life of hard work and struggle. But as much as I detest Loy Mauch and other politicians who have come out singing the praises of slavery and slaveholders rather than acknowledging America’s original sin, I think we all–need to understand the debt we owe to our Ancestors–and be not mistaken–the servants of King Cotton–are all of our Ancestors—no matter what background you are–this is about America. America is all of us and our layered experiences. If the textbooks are changed and the politicians and pundits change the story–we have only ourselves to blame. For me, on an 80 degree plus day in Surry County, Virginia, I will brave sun, snakes, cotton burrs and mosquitoes to recreate a day’s labor on a cotton plantation. I will not have the benefit of real company, and as the pictures and videos we take will show, it will be a fairly lonely exercise. I cannot be a scholar of American slavery and African American foodways and not walk the walk..and that walk is leading me straight into a part of American history that so many would rather forget. My food will be a piece of cornbread, a biscuit, beef bacon and water. That’s it. I will work for 8 hours–sun to sun–although we are being flexible about that. I am going into the field to create a record—that in 2012, we still care, we still remember, we still understand how indebted we are to the 3.9 million antebellum enslaved people who laid a foundation-not only for wealth and progress, but also for resistance, struggle, freedom and democracy. my families’ slaveholder and an ancestor. In Northern Alabama, my family was owned by the Townsend brothers in Madison County, Alabama who had large cotton plantations with lots of enslaved people. In that case at least we know that my Ancestors lived on one of the two brothers large holdings (they had eight plantations). The Townsend brothers both died with the desire to liberate many of their enslaved laborers and their families. Not bitter, not angry–just telling the truth. I’m teaching about the Holocaust in Hebrew school. How would you have me tell the story of my Ancestors in slavery if not in clear terms of “it was complicated, it was bad, it was confusing, its legacy is unending and its our history and we need to deal with it.” Nuff said. Moving on. Food and slavery was colloquial and discretionary. Judging from the strange and complcated relationships had my Ancestors with their “owners,” I can guess that the relationship with the food supply was probably interesting as well. If your ancestors lived on cotton plantations in the Deep South, by 1860 they probably lived on a diet based on corn and pork in their preserved form. Corn=hominy, hominy grits, cornmeal, cornbread, hoecake/ashcake, mush, kush—a cornbread scramble made with hot pepper, fat and onions, dumplings, meal breading, cornbread/cornpone, corn liquor, and corn on the cob (green corn). Pork=salted and smoked meat, offal (the heads, feet, tails, intestines, ears and the like) were the predominant carbohydrate and protein of the Cotton Kingdom. Only occasionally would people enjoy fresh meat in other forms–beeves, sheep, goats, chicken, fish, or game. And of course there were gardens….if you were allowed to keep them. In the word of King Cotton–industrial style slavery had taken hold. Probably–and this is me guestimating here–only about 2/3 of enslaved people living under King Cotton were allowed to keep their own garden spaces in any significant way. Many enslaved people reported not being allowed to do any work or labor other than working in cotton or receiving garden truck from a large communal garden maintained by the elderly. The most commonly mentioned field crops were cabbage, cowpeas, watermelons, and sweet potatoes–often grown in their own separate fields and after that–enslaved people might grow greens gardens–usually collards and turnips—and string beans and white potatoes were usually the remaining big crops. Other foods like homegrown rice, red peppers, peanuts, tomatoes, herbs, pumpkins, okra and the like were infrequently dispersed and we should not think of them as being necessarily common. This system was not based in part on a new literature unique to the antebellum era where the management, care, and control of enslaved people was a frequent subject of agricultural and trade journals basically encouraging planters to maximize results and get more bang for their bale. Rations of salt, molasses, coffee, white flour, orchard fruit (apples, peaches, etc.) and on some farms, sweet potatoes, rounded out any sort of gathered wild greens and fruit and hunted and caught foods available within the plantation ecosystem. I like to describe game as usually belonging to the four food groups–including possum, squirrel, rabbit and racoon. Living in largely landlocked places, the creeks, swamps, rivers and wetlands provided various species of catfish, perch, buffalo, bream, bass, trout, gar, crawfish and freshwater clams and mussels that formed the surf to their turf. Usually those were rare protein additions to the diet. If your ancestors were subjects of King Cotton like mine, this is probably how they ate. Mix the cornmeal and salt in a bowl. Add the boiling water, stir constantly and mix it well and allow the mixture to sit for about ten minutes. Melt the frying fat in the skillet and get it hot, but do not allow it to reach smoking. Two tablespoons of batter can be scooped up to make a hoecake. Form it into a small thin pancake and add to the pan. Fry on each side 2-3 minutes until firm and lightly brown. Set on paper towels to drain then serve immediately with country bacon or soaked salt fish. Thank you for this post. Going to reread. Thank you for being real. Great Article: I like the detail…Are you going to write about what the 8 hours were like? Took me longer than 8.